Vaikaradhoo is one of the inhabited islands of Haa Dhaalu Atoll administrative division of the Maldives. Geographically, it is part of Thiladhunmathi in the north of the Maldives. It is a medium-sized agricultural community by Maldivian standards. Vaikaradhoo was one of the islands severely damaged by the great cyclone of 1821 that hit the northern atolls of the Maldives. The ruins of a hawaitta (archeological mounds) known locally as the Jaadi Valhulithan stand on the western periphery of the island. The larger of the two mounds measures 55 by 75 feet. 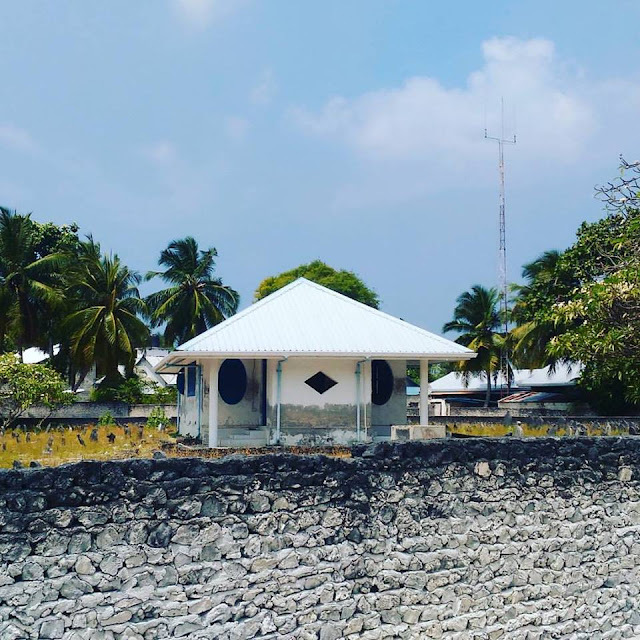 The apparent remains of a mosque created by early inhabitants of Vaikaradhoo are found on the nearby uninhabited island of Vaikaramuraidhoo. A cemetery and a well are found in close proximity to the site. Maamiskiyy Tharaagandu, located close to Virares office, is believed to be the second oldest mosque used as both cemetery and mosque. Present archaeological evidence predicts that it was built between the 15th and 17th centuries, and it was built in the center of their village allowing the villagers to access the mosque with ease. In addition, the place had coconut trees, bread and fruit trees which were grown domestically. After World War II, the island became notable for a high literacy rate and awareness of general knowledge. Schools were built to teach Quran, essential religious concepts, and Arabic. Most of the teachers were local people familiar with the Arabic language. In 1984, with the help of Japanese grants to Maldives, five schools were built with administrative offices and lodging. Students were admitted to grade one who were 6 and half to 7 years old. Students above 7 years old were admitted into "special classes". At the time, there was no special curriculum for them. In 1989 new school master Mr. Hussain Hassan made arrangements to discontinue special classes, allowing the students to enter grade classes according to their qualification. Soon grade 6 and grade 7 were introduced to the school. After two years, Mr. Hussain Hassan left for another Island. In 1994, school management introduced grade 8 to the school. In some cases, students were held in the same grade for more than four years in hopes of joining eighth grade. The dream was realized in 1996, when they introduced 8th grade commerce stream. In the year 2013 higher secondary Education was introduced with 5 students. The island specialized in producing a few varieties of short-term crops, including watermelon, scotch bonnet pepper, green chili, papaya, taro, and pumpkin. From the beginning of the 19th century, they were the largest producer of finger millets in the country, which helped them to stave off starvation during World War II. Finger millet (Binbi) and screwpine (Kashi-keyo) fruits were largely traded between Raa atoll people in exchange of goods or money.